The main pillar of RowShare integration is its API (Application Programming Interface). Thanks to HTTP requests, this JSON API standardizes how you handle tables and content. All user actions on our web site actualy leverage our API. This allows you to integrate RowShare with your own applications, either as a data source or data entry and retrieval interface to benefit from various features, including streamlined rights management, notifications, attachments or document generation. Our API is documented on SwaggerHub. RowShare API is available to our Business and Enterprise customers. If you use the free version of RowShare, you only have access to our API during the first weeks of your subscription. Upgrade to Business or Enterprise to keep API access. 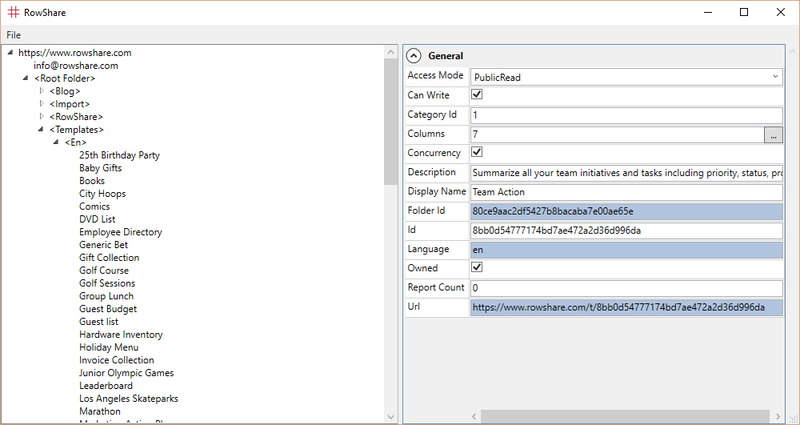 We have also published a sample application: RowShare Tool. Its source code is available on GitHub. This tool leverages the API's main features by letting the user log in, copy, export and import tables within a RowShare account or from one account to another.